Preston Studios collaborates/works with many architects, builders, and especially interior designers. This 2014 entrance (above) was designed working with Toni Mays Interiors for a residence in Charolais, Viera, Florida. It features super thick Action Bevels, as well as three hand painted and kiln fired medallions by Stanley Klopfenstine, as well as the “faux wrought iron” effect also painted and fired by Stanley. Preston Studios has worked extensively with Liz Harris of Designers West to create a number of highly specialized and unique installations for homes in Central Florida. One on Lansing Island in Satellite Beach includes a large oval ceiling some 18 feet by 12 feet in size. The theme is derived from the French High Baroque, which befits the architectural “chateau-style” of the residence. Preston Studios has designed and created a number of works over many years for custom home builder Chris Burton. Entrances by Preston Studios with Christopher Burton Homes have graced many annual Parade of Homes models by Chris over the past fifteen or more years. Each custom design was created to compliment the architecture of the home and is intended to be a permanent added value to the property. In the case of the 2012 photo at right, the theme was “Transitional” working with the Inspirations showroom – “faux wrought iron” elements were hand painted and kiln-fired onto the glass by master Stanley Klopenstine in simple clean lines. Earth-tone glass compliments the intarsia floor inset, as well as the square shaped bevel sets from Action Bevels. 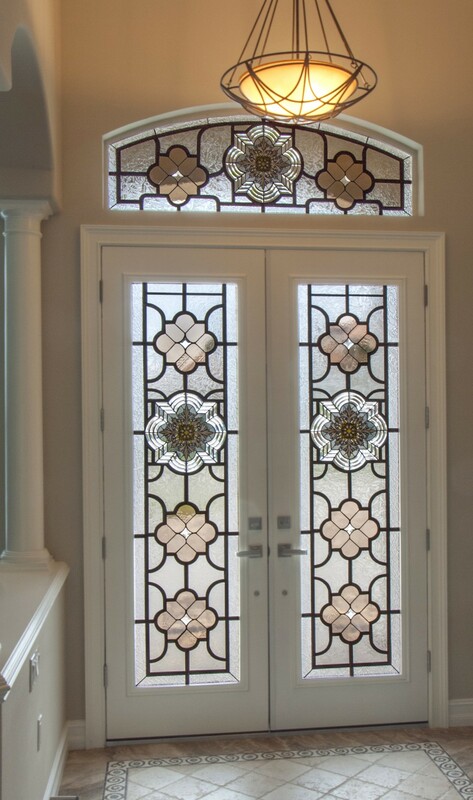 Another installation with Liz Harris is an entrance in Bayhill, Orlando, for a private home. Here the clients specified that they wanted a full-on nature scene related to their lake-front property.Preston Studios has worked with Liz on many other projects as well. Interior designers can often work as the “translator” – giving the artists at Preston Studios the right “art speak” to understand more clearly what each client is looking for. Preston Studios has worked with numerous interior designers such as Betsy Godfrey Interiors and Suzanna Lawler at Lawler Design, to Bill Hofer of Hofer Doster Designs in Ft Meyers….. Another major Space Coast interior designer Preston Studios has worked with extensively has been Toni Mays….